← Who Ya Gonna Call? What’s the Difference between the Presbyterian Youth Triennium and an American Political Convention? The Youth Triennium was held in Indiana last week and one party’s convention was held last week in Ohio. The other party’s convention will be held this week in Pennsylvania. Both of last week’s events featured people who were whipped up in the frenzy of the moment. Both featured people wearing funny hats. 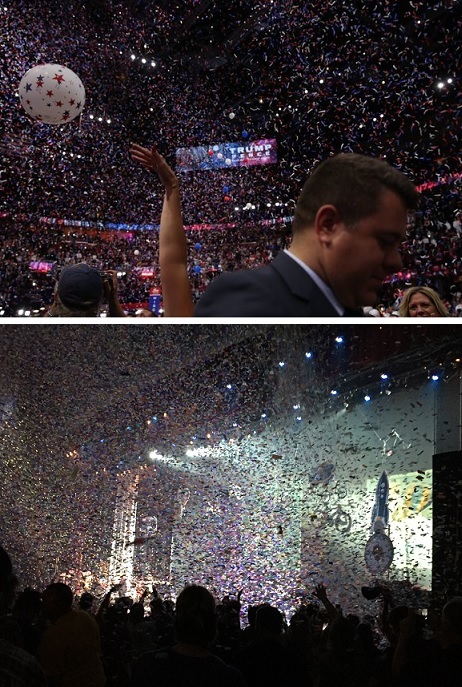 Both events were held in huge venues with screens and spotlights and balloons and confetti. Both events included inspiring speakers and rousing music. Both events prompted religious fervor. But these events could not have been more different. One allowed hate and darkness to overshadow love and light. The other lifted 5000 lights into the sky and asked participants to take that light out into the world. One – in our Land of Liberty – vilified those whose opinions and beliefs differ from theirs within the realm of patriotism. And the other addressed the diversity of opinions and beliefs within the realm of Christian orthodoxy. One event included calls to “lock her up” and to “execute her” (speaking of Hillary Clinton) to the point that I was almost expecting people to start shouting, “Crucify her! Crucify her!” The other event called people to go out into the world and make disciples. One event included a speech declaring that the candidate could single-handedly fix the problems of the world. The other event included a sermon by Steve Wilde that declared that “God has always chosen to work and act through unimpressive and inadequate people—normal, insecure and slightly freaked out people like you and like me.” Steve was joined by other preachers who shared similar messages that proclaimed that we cannot actually make a difference alone. I could go on and on but you get my drift here. And my point is that it will also be equally as disappointing if this week’s political convention espouses a similar message of demonization and darkness and cosmic self-sufficiency. Friends, our world is a hot mess and yet there is light. I saw it brilliantly shining last week at Triennium as I’ve seen it throughout my life, and I pray you have seen it in your lives too. There is light in the world when oppressed people are protected and treasured. There is light in the world when enslaved people are set free whether that slavery is a result of human trafficking or addiction or the lie that we are not included in God’s love and mercy. There is light in the world when 5000 high school students commit to going out into the world to make it better in God’s name. There is hope in the world when adults give up their vacation time to chaperone youth events or volunteer for mission trips. There is hope in the world when life looks impossibly dark and someone chooses to sit with us in that darkness. Every day I see goodness. And the beauty about being one of the Co-Moderators of the PCUSA is that I increasingly witness goodness in remote corners and among strangers who become friends. I am not naive. I know that political conventions are not overtly spiritual events. And yet . . .
We are called, my friends, to go out and bring light and life into the world. We are not called to villify each other and build temples to ourselves. We were born to bring hope. Amen and Amen!! Thanks for this post Jan……..